Are you thinking about a new look for your hair? 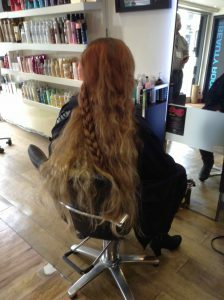 Time for a hair restyle? Why not come and see us for a full and free hair consultation, before we deliver you a stunning hair restyling in our central Bristol hair salon. 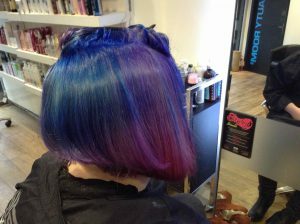 Jody (16) pictured above – who is also the niece of Creative Director Aidan Garlington – came into our Baldwin Street hair salon with waist-length hair and wanted a dramatic hair restyle. 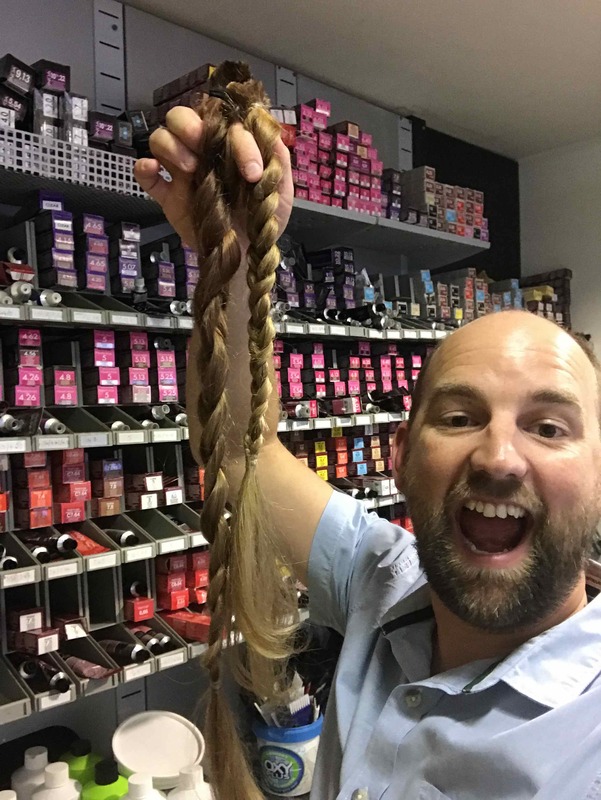 She also wanted to donate both of her long hair plaits to the Little Princess Trust, a charity that makes real hair wigs for young cancer patients and children suffering from hair loss problems in general. 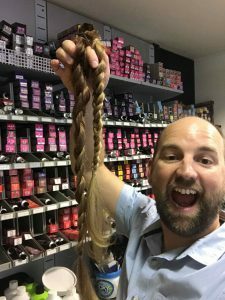 The hair restyling began with a full consultation, to consider the options available and also to ensure that Jody would be happy with the final look. The hair was sectioned from the left-hand-side to the top of the right ear, with everything below that line being clippered to a number two length. Everything above it was taken across to form a bob shape for the right-hand-side, leaving the ability to part on the right for an asymmetrical classic bob. The hair was pre-lightened twice using L’Oreal Platinum to a pale yellow base, then coloured with L’Oreal ColorFul. 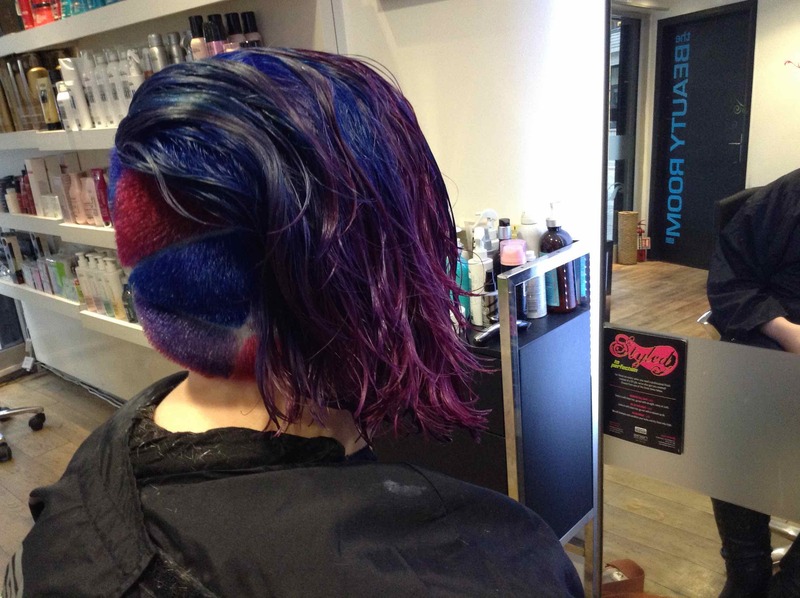 One horizontal section was coloured at the roots with Electric Purple and the ends with Hypnotic Magenta, whilst the next section up was coloured with Navy Blue fading into more Hypnotic Magenta, creating an amazing look. This complete hair restyling service took over five hours, and would cost approximately £200 at our central Bristol hair salon, with the hair going to a good cause. Well done Jody! To find out more about the Little Princess Trust, please visit here. 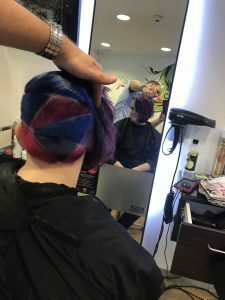 To see the full range of hair restyling, hair treatments, gents hairdressing, hair care, hair colouring, hair styling equipment, hair products, hair styling, haircuts, hairdressing, and hair extensions we offer, please get in touch here. Looking for a Tom Hardy men’s haircut in Bristol? Read this! 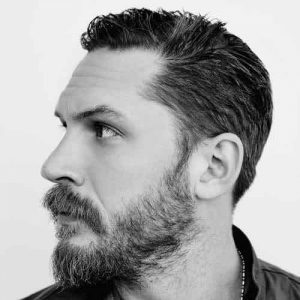 We’ve had a few requests in recent weeks for a Tom Hardy style of men’s haircut in Bristol from our male hairdressing clients visiting our Baldwin Street hair salon. Seeing as this British actor has such a strong and iconic look, our team of central Bristol hairdressers decided to focus on this particular hairstyle for men, seeing as we offer the full range of gents hairdressing services. The picture above sporting one of Tom Hardy’s recent popular looks is a great example to recreate, and our male hairstyling clients have loved this one. 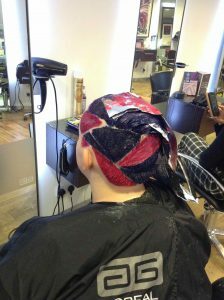 It’s a short and sharp clipper cut on the sides, leaving some length at the top to create a workable, texturized finish. The Tom Hardy look was finished using clay wax, with British Hair texturizing powder and Beach Waves sea salt spray for a messy but defined men’s hairstyling look. Pricing for this men’s haircut at our central Bristol hair salon ranges from £19 to £24 – just ask for further details when you visit us, or ring to book your appointment. The second picture of Tom above shows a variation on the previous look. As the initial style grows out, the sides become softer and can be styled and worn pushed back. The top can then be left with a swept back, sleeker look. We offer all of our men’s hairdressing clients a full and free hair consultation in central Bristol, so if you’re unsure which men’s haircut is right for you, simply ask one of the hairdressing team at our Baldwin Street hair salon and we’ll be happy to advise you further on the best men’s haircuts and products. To see the full range of gents hairdressing, hair care, hair colouring, hair styling equipment, hair products, hair styling, haircuts, hair treatments, hairdressing, and hair extensions we offer, please get in touch here. 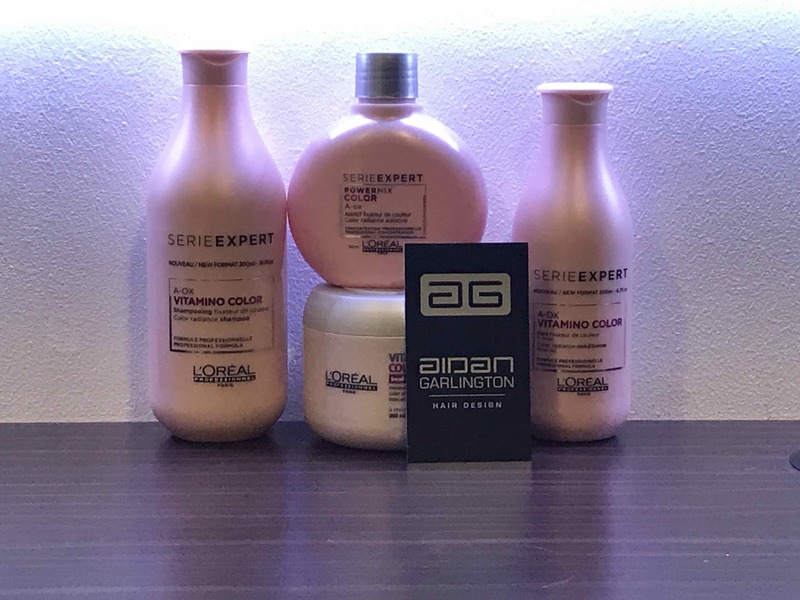 We’re really pleased to be able to announce that our hair colouring experts in central Bristol now have a new hair care treatment available to offer clients. As part of the legendary L’Oreal Serie Expert range, it’s also incredibly quick and easy to apply, and can be delivered as an in-salon treatment or at home. The Masque is applied and massaged into shampooed and towel-dried hair, then left for 10 minutes. After rinsing out and washing, the full benefits of the Masque will be felt immediately. Our hair colouring team in central Bristol recommend using the L’Oreal Vitamino Colour Masque to extend the life of hair colouring products, as it is part of the L’Oreal Professional Rnage and contains AOX, a molecular addition which helps to maintain and lock in hair colour for longer. The other benefits are superb, but for us, as leading hair colouring hairstylists in central Bristol, the main benefit of L’Oreal Vitamino Colour Masque is to provide a no-fade sun protection hair care treatment quickly and easily. And to celebrate this fantastic hair colouring enhancement treatment, we’ve got a great exclusive offer at our Baldwin Street hair salon on the Masque. Ask our hairstyling team in central Bristol for further details on the L’Oreal Vitamino Colour Masque, as well as our full Serie Expert hair products. To see the full range of hair care, hair colouring, hair styling equipment, hair products, hair styling, haircuts, hair treatments, hairdressing, and hair extensions we offer, please get in touch here.